Achoooo! 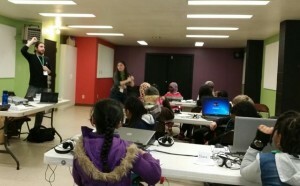 Olympic Hills students sneezed, in unison, as they learned computer game coding at the Lake City Community Center this week. 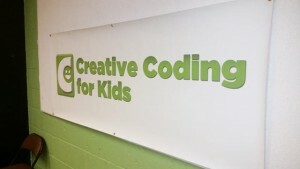 Their effort was part of a holiday break to participate in a Creative Coding 4 Kids Camp. The collective ‘sneeze’ was electronically recorded as part of their learning process to build their own computer game. 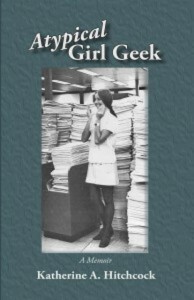 Funded by author Katherine Hitchcock, a retired IBM programmer, this UW grad is directing the proceeds of her book sale (Atypical Girl Geek/ Amazon /http://atypicalgirlgeek.org/) to the effort with CC4K (http://www.creativecoding4kids.com/), a for-profit. The nonprofit, Interconnections, was also part of the equation, as their laptops with gamer programming hardware (scratch) is given to each of the 24 students at the end of the week-long camp. The Olympic Hills PTA was instrumental in the effort to bring the 4 day camp to Lake City. During the holiday break, students had a snack and recess built into each morning and afternoon session. 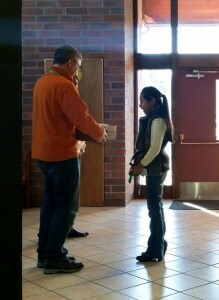 The Lake City After School ELL students from Olympic Hills were well represented in the 4 day Camp. Access to expanded learning opportunities like CC4K for those in need is a goal well worth supporting for the Lake City community. 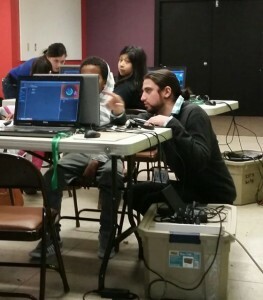 MC2 is committed to put programming in the community where it’s needed most; the effort of many keeps the goal alive. CC4K instructor Nick engages students in coding fun.